I didn’t plan on going over the best Las Vegas sportbooks because there’s no such thing as a bad sportsbook. There are varying degrees of greatness but sportsbooks are the best place in the casino as far as I’m concerned. Since I’m at sportsbooks often people ask my opinion so I figured that I should have a current list as football season is upon us. My main criteria for the best sportsbooks are TV’s, cleanliness and service. Watching the games is the reason I’m at the sportsbook so the quality of the TV screens usually matters more than anything else. That said, I don’t smoke and don’t want leave the sportsbook smelling like an ashtray. 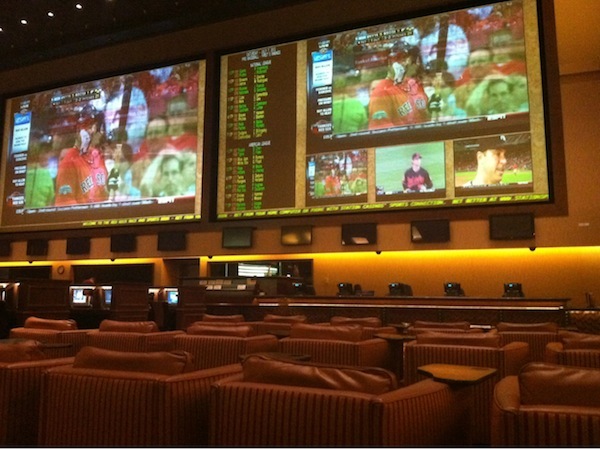 Let’s look at the best sportsbooks in Las Vegas. The Venetian sportsbook is the best free sportsbook in Las Vegas. The Venetian sportsbook renovation is going on two years now but it still looks brand new. The lighting and TV screens at The Venetian sportsbook are by far the best and brightest of any sportsbook in Las Vegas. 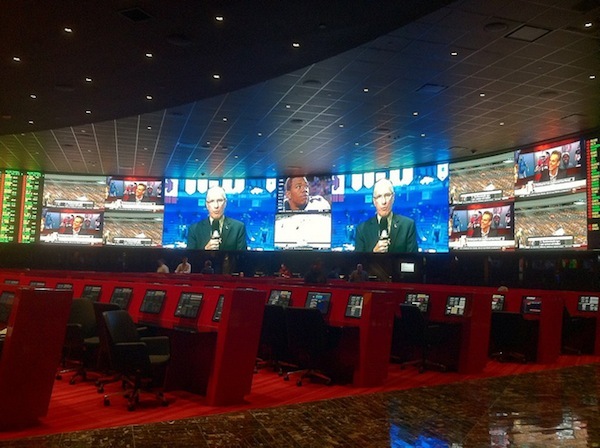 The Venetian sportsbook is operated by Cantor Gaming and looks similar to all of their sportsbooks in Las Vegas with red desks and big office chairs. If it wasn’t for those beautiful TV screens this sportsbook would have zero vibe but those TV screens make up for any lack of atmosphere from the decor. The desks have outlets should you need to power your phone. Between the lack of cocktail waitresses and the condescending Cantor Gaming staff don’t expect good service. The saving grace for service at the The Venetian sportsbook are the quick and polite bartenders. The poor service is masked by those gorgeous TV’s. 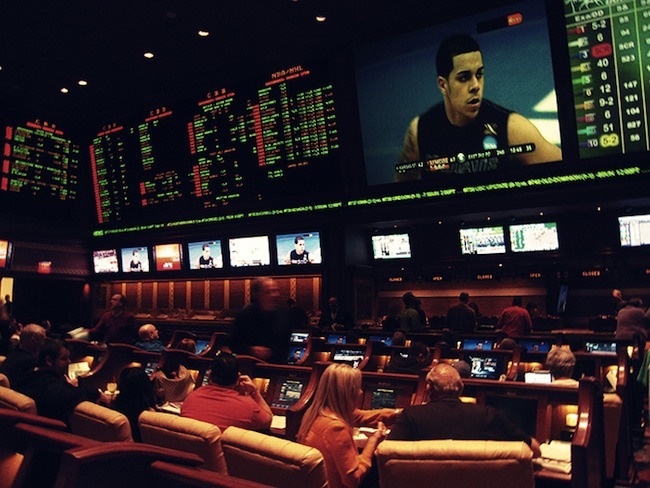 The sportsbook at Red Rock Resort is without a doubt the best sportsbook off the Vegas Strip. 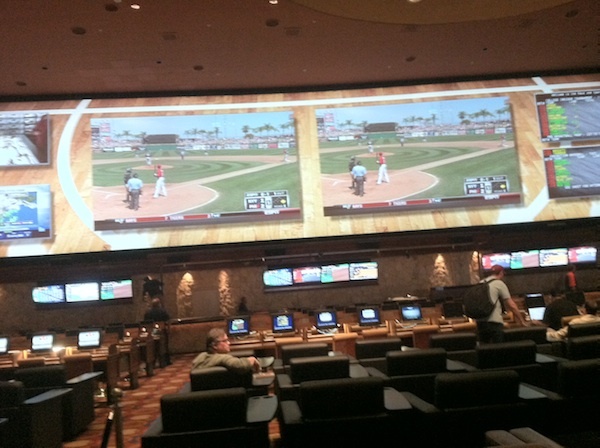 The best quality of the Red Rock sportsbook is it’s size and flexibility. It’s huge and has 3 enormous projection screens which can fit anywhere from 1 to 4 games each. The seating is made up with 2/3rd’s desk, dinner chairs and individual TV’s and 1/3rd lounge chairs. Cocktail waitresses are always walking around so drinks flow quickly. Depending on your ticket writer drink tickets can be fairly easy to come by. If you don’t get one just ask. The Red Rock sportsbook is always packed for football and the energy is great. 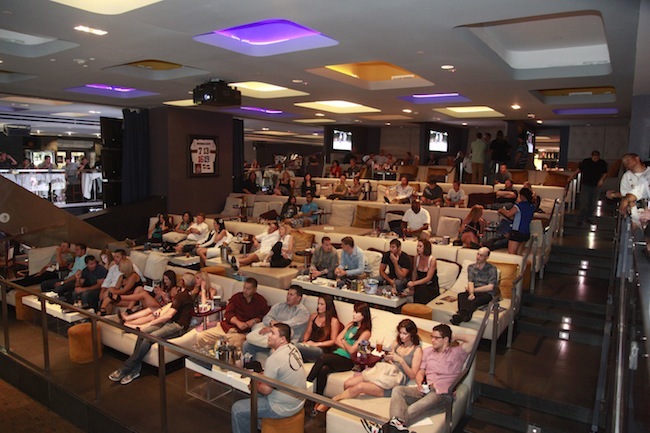 There is a bar in the back of the sportsbook that offers more chairs and great bartenders. I may be partial because it’s my local bar.